Sorry I haven't been very good about sending you pics. I will take more when I get a chance and dig back through the progress pics and send some as well. Attached are a couple pics I sent to Ted Ferringer to make us a custom screen. It is a 42" Rumford in southern NJ. We had 2 semi (possibly now fully) retired masons. This was their first true Rumford. They expressed some concern in the beginning because they had built Rumford style boxes with standard smoke shelves in the past that didn't work. I think one of them is still skeptical about how it will work, but I cannot wait to burn a fire in it! 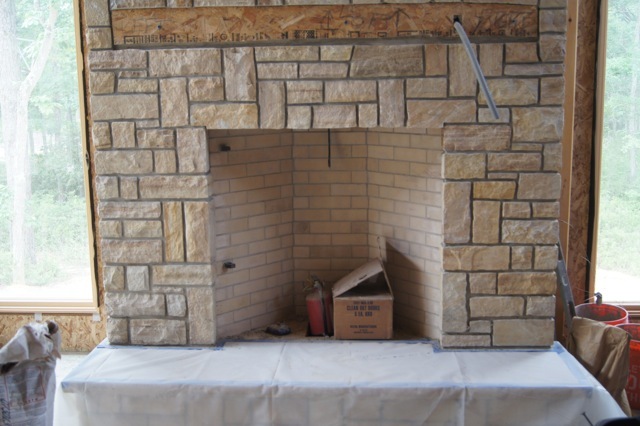 We are building the house ourselves as the GC and I am doing much of the work myself as well, so we are still quite a way off from move in, but it sure is nice to have the fireplace and chimney nearly done! Please let us know how it works when you finally get to try it.